Last night I dreamed that I was back at Amesbury. This is a recurring dream of a place that I loved a lot as a boy. Imagine loving your school? For me it was and remains a magic place where the best times of my boyhood took place. I arrived in the summer of 1959. I had been living and going to school in Ghana. This was my first time away from home. My sadness at being separated from my mother was immediately replaced with embarrassment. You have seen the Harry Potter films. Imagine Waterloo station packed with uniformed school boys. My mum had not looked at what I was to wear and had dressed me in the school blazer - not a silly thing to do. But the code was to wear the school suit. I was humiliated as only an 8 year old boy can be. What made Amesbury so special for me was a combination of some key people, a beautiful place and the freedom that we had to be boys. 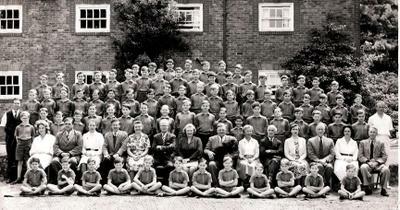 The big man in the centre with the dog was the headmaster and owner of the School, Tony Peel. He was a bull of a man. Rough and tough. On my last day, he beat the entire school save maybe 5 or 6 boys. We had been having a mass pillow fight and matron could not get us under control. By the time he got to the P's, he looked worse than we did. But those were different times. It is not the beating that I remember Tony Peel for - it was his great love of history and English and the huge energy that he brought to its teaching that has been a foundation of my life. The hangman addressed himself to his office. But he had been disconcerted by what the Duke had said. The first blow inflicted only a slight wound. The Duke struggled, rose from the block, and looked reproachfully at the executioner. The head sank down once more. The stroke was repeated again and again; but still the neck was not severed, and the body continued to move. Yells of rage and horror rose from the crowd. Ketch flung down the axe with a curse. `I cannot do it,' he said; `my heart fails me.' `Take up the axe, man,' cried the sheriff. 'Fling him over the rails,' roared the mob. At length the axe was taken up. Two more blows extinguished the last remains of life; but a knife was used to separate the head from the shoulders. The crowd was wrought up to such an ecstasy of rage that the executioner was in danger of being torn in pieces, and was conveyed away under a strong guard. No PC approach for Mr Peel!. When we did Shakespeare, he added in the full sound effects - pounding the desk for thunder in the witches scene in MacBeth. Mr Peel was no academic but his love of history and literature was infectious. I have been captivated ever since. The tall - fine looking man on Mrs Peel's left as you look at the picture was Tony Webb. Major Webb was the heart of the school. Tony had no money and lived in a small room in Bracklands. His room, was maybe 8 by 12. I think that he had had a hard war. I saw some pictures in an album that he kept hidden away - hey we were boys - I suspect that he was in intelligence and they showed some terrible things. 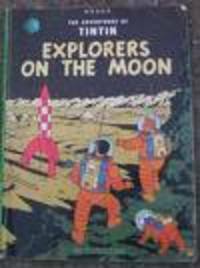 The main reason for our raids though were to "borrow" from his collection of Tin Tin books. Tony Webb was the Yin to Tony Peel's Yang. When Tony Webb died early in 1969, Tony Peel lost his footing and the school went into crisis. We all respected Tony Peel but we adored Tony Webb. He was kindness personified. On his afternoon off - Wednesday's - he would bicycle to the station and go into London. Many would simply relax in town. But Tony Webb always had chores. We would give him a shopping list - usually for Airfix models - and he would spend his time off filling our orders at Hamleys. Tony Webb was a great showman. It was he who arranged all the big events of the school such as sports day. He would tour the dorms at the end of the day making sure that we were all OK. He was the soul of the school. Tony Webb taught French. But he also directed the school play - thus lighting another life long fire for me - the stage. His trusty right hand woman was Rosemary Diggle, who just died the other day. She is on Mr Peel's left our right looking at the picture. The two were very close friends and shared a spiritual warmth that shines still beyond the grave. Miss Diggle lived in a tiny cottage on the grounds and I used to take extra French with her after dinner. It was really just an excuse to be with her. 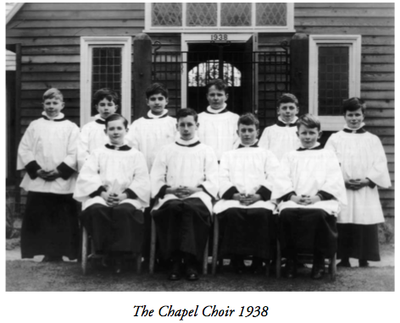 For nearly all my time at Amesbury, I sung in the choir. Here it is in 1938. We wore scarlet cassocks and were all but professional. I sung every day plus twice on Sunday and had 3 choir practices a week. For me Christmas will always be the service that we sung at Amesbury. My love for choral music remains deep and ongoing though my faith has long departed. Miss McLellan was our intrepid organist and choir mistress. We always wondered if she and Mr Jessop had a thing going? The man in white on the right of the Picture was "Sarge". Sergeant Major Moule taught gym which I hated but he also taught me to box which I loved. He treated us like men in waiting. Many of the staff had been in the war and for us then - the war seemed as if it had just ended. But we were special. General Montgomery was a widower. 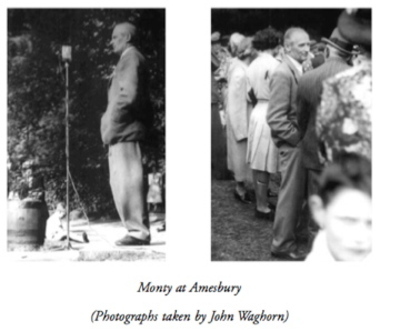 His son David had been a boy at the school and Monty made Amesbury his home during the war. The headmaster was David's guardian. Monty spent the night before D Day at the school and had dinner with the boys. Desparately shy, Monty felt very relaxed with the young. He would come back to the school quite often after the war. We thought he was god. He had a special car with a front window that sloped inwards at the bottom and his caravans that are now in the Imperial war Museum used to be kept on the property. My life long love of all things military was set again here at Amesbury. This is a picture taken in 1943 of the boys using an incredibly scary fire escape from the top floor at Bracklands were most of the class rooms were and where most of the staff lived. We had another system in the main school building that used a rope and a pulley with a brake. After a fire at the school, someone set Mr Peels canes alight, where the fire drill did not go very well as no one in the upper dorms would use the rope thing, Mr Peel called down the fire escape man from London. He sat in the upper window and lectured us - we were all drawn up in front of the building. He would have been in one of the small windows on the upper floor. He stepped off confidently and the pullet pulled out from the anchor in the wall and he fell to the ground breaking his leg. We all thought this was the funniest thing ever. The ropes were removed. As much as anything though, I loved our freedom. While we were confined to the grounds of the school, what grounds. 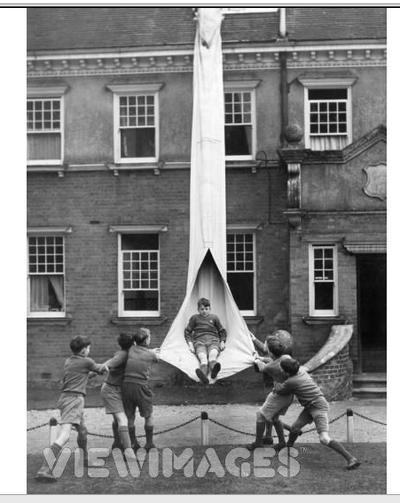 We were also expected to be boys and to run around climb things - have gangs and clubs - build forts - get dirty. 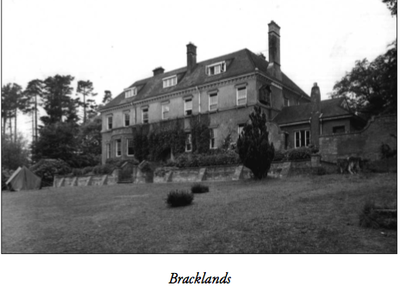 Here is Bracklands from the rear - the garden ran into a huge wood that was our secret boys world where we lived as wild things. So quite a moulding happened to me at Amesbury. Most of the aspects of life I love the most were set here. I was also given a good model of how to be a man. Thank you all - I see you in my dreams. 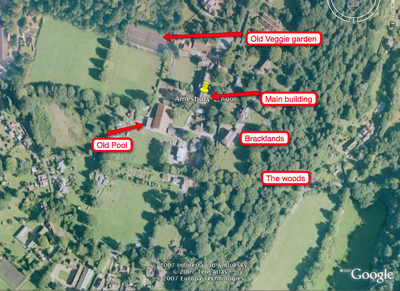 Here is a modern view using Google Earth of the school as it is today - Bracklands has been sold. 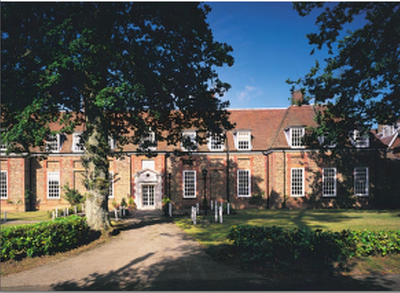 I am thrilled to be able to say that after a dark time in the early 1970's after Tony Webb's death, the school has truly prospered and has the most wonderful ethos. Here is a picture taken in 1995. It is a day school now with a nursery and pre-prep. 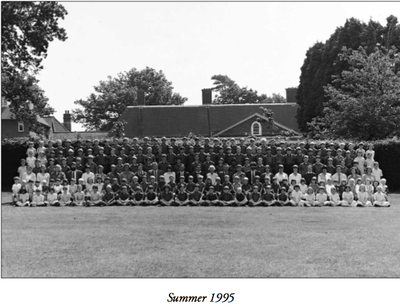 Many of the pictures of the old days are to be found in a remarkable booklet called Amesbury Rejoices. There is a good piece from this on Wikipedia - here. 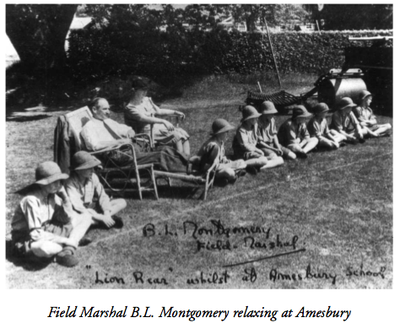 I would love to hear from any of you who have pictures or stories of your time at Amesbury.